The Alberta premier's office has put out a statement that one of its firefighters died Thursday while fighting one of the forest fires in Red Lake, Ont. Firefighter Jerry Gadwa was from Kehewin, a Cree community northeast of Edmonton. The premier's office would not confirm the cause of death, just stating that he "unexpectedly passed away." "Mr. Gadwa and his fellow firefighters were in Ontario fighting to defend the well-being of their fellow Canadians. The sacrifice they and their families make is extraordinary and is felt heavily in hearts throughout Alberta and across Canada," Alberta Premier Rachel Notley said in a statement. "Mr. Gadwa's brave and selfless actions will be remembered. To those who knew him beyond his career – his family, friends and loved ones – it is my hope that your memories of him give you comfort, and that the shared grief of a grateful province and country provides you with peace." Where are the new fires? There are less new fires that have been started than any other day this week. All are in the northwest region and were started by lightning. There's a small fire in Red Lake, 0.1 hectares in size. The fire is under control. Another fire is burning on Blackstone Lake, in the Sioux Lookout district. It is 0.2 hectares in size and being observed. The final fire is inside Wabakimi provincial park, near Suzanne Lake in the park's north. It's the largest of the three, 2 hectares in size, and is being observed. An Alberta firefighter has died while fighting forest fires in Ontario. Premier Rachel Notley offered condolences Friday following the death of Jerry Gadwa from the Kehewin Cree First Nation reserve, approximately 225 kilometres northeast of Edmonton near Bonnyville. The premier visited the Britt Command Centre Friday afternoon to take a look at the forest fire response plans and meet some of the emergency staff. He did not tell local media about his trip in advance so the news of his visit is catching reporters on the ground off guard. A statement released by the premier's office said Ford was joined by Jeff Yurek, minister of natural resources and forestry. The statement said the government is doing "everything" they can to fight the fires. The fire is beside the Anima Nipissing Lake and is small, 0.1 hectares in size. It is under control and was caused by lightning. Mark Solomon is a member of Henvey Inlet, the first nation at the centre of Parry Sound 33. It's where the fire started by. 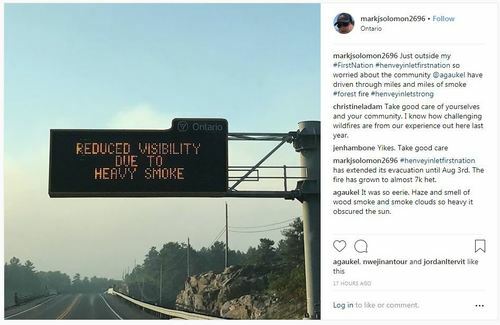 He posted this photo on Instagram yesterday, showing a local road sign, with smoke visible in the distance. He said he has driven through "mile and miles of smoke" and was "so worried" about his community. Natural Resources Canada runs the Canadian Wildland Fire Information System interactive map, which shows where forest fires are across the country. However, the provincial ministry of natural resources and forestry said the map is inaccurate in showing just how big or small a fire is. Brian Wiens works for the feds as the director of operation and planning at the Northern Forestry Centre. He said they use a number of satellites to get an automatic detection of hot spots. From there, you can guess where the fire likely is. But there's a number of problems with that, something Wiens admits. He said there is "a lot of uncertainty" with the maps. It's still worth a look but something to keep in mind while you are browsing. ... the Parry Sound 33 fire is nowhere near Parry Sound. These fires are being named for the district they fall in. In the case of this fire, it does fall in the Parry Sound district, hence Parry Sound 33. The fire is about partway between Parry Sound and Sudbury. How do the firefighters shower in the field? I'm assuming it would get sweaty fighting forest fires all day long. Luckily, they've rigged up field showers. It's a similar setup to what the military does. The CBC's Kari Vierimaa is travelling along Highway 69. He said smoke is heavier now than it was earlier in the week, something we are hearing from several in the area. What about French River Provincial Park? The park west of Highway 69 remains closed, including the visitors centre. The park is rerouting campers to the upper part of the river, east of Highway 69, where back country camping and access remain open. 30 back country campsites were evacuated and 135 back country campsites on the west side of Highway 69 were closed. "We do not know at this time if the park will be affected by the fire," Ontario Parks said in a statement. "When it is safe to do so, park staff will complete a full assessment of park values including campsites, access points, trails and the park landscape." There's no set date for when the park will re-open, just simply "as soon as it is safe to do so." Here's one of the park wardens at Grundy Lake provincial park helping people evacuate. 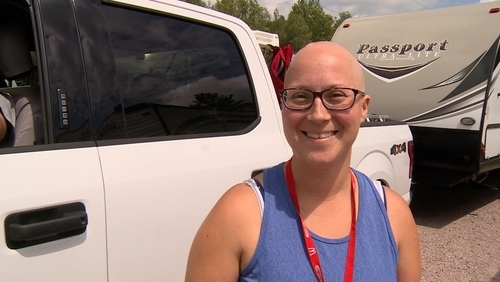 Anne Marie Calhoun was camping at Grundy Lake with her family of six from Midland, Ont. They knew there was a fire nearby but decided to come anyway. "We had a good day yesterday, were hoping for a good weekend and then the news came that we had to evacuate," she said. 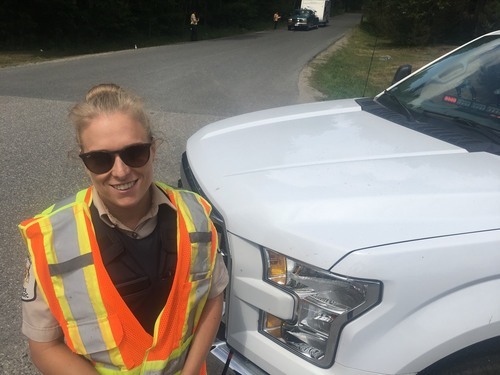 The evacuation went smoothly and she managed to snag a spot at nearby Oastler Lake Provincial Park, about an hour south of Grundy Lake. They are heading there now. Courtesy of Jim Rook, a councillor with the municipality of Killarney. He said the weather forecast is not promising because of the expected strong winds and predicted lack of rain until mid-next week. The first nation was evacuated and is under a state of emergency because of Parry Sound 33. Fire crews have been camped out in the community's pow wow grounds. 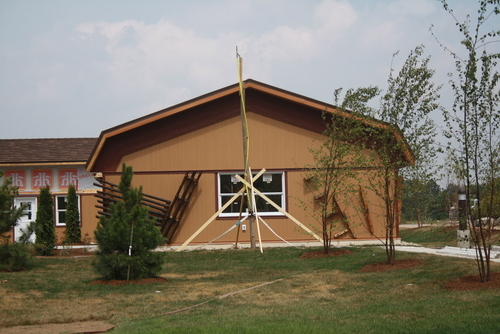 There's an eight-plex under construction in the community ... a big deal for a community with only 150 people in it. You can see the sprinkler system set up trying to protect it from the fire. 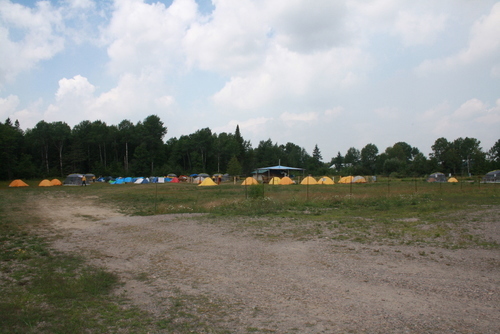 That's the time we are hearing that campers have been told to be out of Grundy Lake park by. Reporter Chris Ensing is at the park right now and said there is a calm and coordinated evacuation going on. Campers told him officials have been going through the park to explain the situation. Some are making calls now to rebook and secure reservations at other parks. We'll be getting more updates from Grundy Lake, as reporter Chris Ensing is heading there right now. 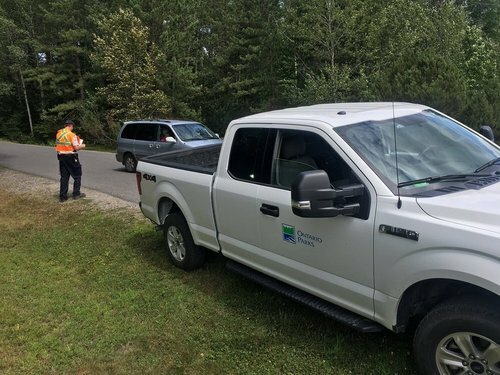 The provincial park has said they are temporarily closed to the public because of the "significant increase level of smoke at times affecting the air quality in the park." Staff is evacuating the park and campers do have to leave but Ontario Parks said the evacuation is not "high-rush" so there is "ample time to pack" for campers who are in the park right now. The road is really one of the main arteries of the northeast. It is the grey road on the right. The flame depicts Parry Sound 33, not far away. And because of that, the road has been smoky. Take a look. Their department of fisheries and land resources just tweeted out this photo of their provincial incident management team arriving in Dryden. The largest fire in that area is Kenora 71, which remains out of control at 10,265 hectares. That's slightly shrunk in size from earlier this week, when it was 10,887 hectares. Conor Whately saw a large plume of forest fire smoke from the northwest fires out of a plane window while flying above Manitoba. 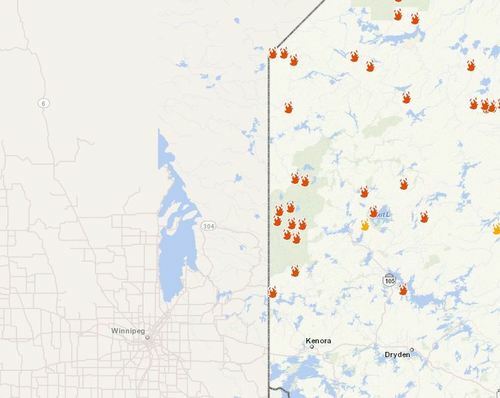 There are at least 15 fires burning on the Ontario side of the Manitoba border. Take a look. 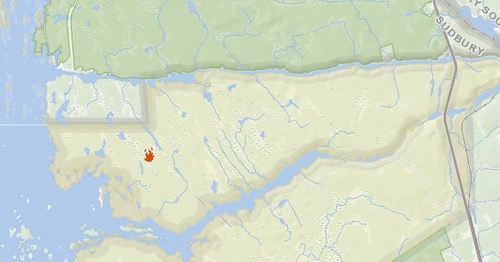 If you look at Parry Sound 33 on the Canadian Wildland Fire Information System, it looks like it is 8,714 hectares. But that's not the case, according to the ministry of natural resources and forestry. That map relies on satellite imagery to detect hot spots and then draws a circle around them but that doesn't mean the area is burning. The ministry said its own fire map is a lot more reliable in terms of fire size. They said the size of Parry Sound 33 as of noon is 7,297.2 hectares. The view from the French River, just outside of Noelville. This is even bigger than was reported this morning. As of Thursday night, the fire was 6,760 hectares. We initially reported that the fire had grown to 8,700 hectares as that is what the Canadian Wildland Fire Information System has pegged it at. However, the ministry of natural resources said that number is actually lower at 7,297. We are looking into the discrepancy between the feds and the province. 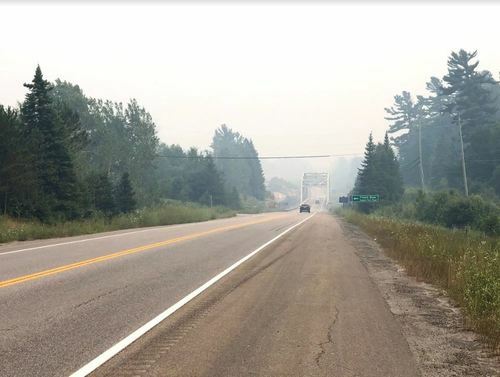 The fire is in the Key River area between Parry Sound and Sudbury and has spread east. Late Thursday, it jumped the train tracks south of Pickerel River (where OPP are asking folks to stay off the water). CN Rail said it has workers at the scene with water pumps, helping the ministry crews, and trying to protect rail infrastructure. A spokesperson for CN this morning said trains are still moving through the region as there are routes away from the fire. While the total number of active forest fires in northeastern Ontario is going down, concerns about at least one of them may be going up. In case you missed it last night, the first nation has extended their state of emergency until at least August 3rd, based on reports from the ministry of natural resources and forestry. 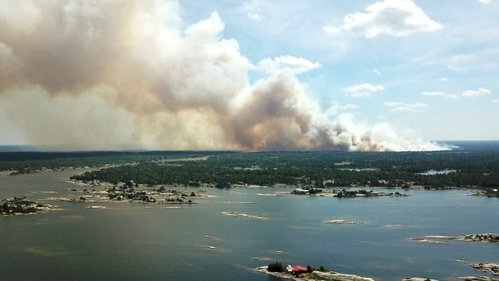 Members from the community of about 150 people were evacuated and are being housed in Parry Sound and Sudbury. This is the community where Parry Sound 33 started. ... warn the OPP. Water bombers have been refilling on those rivers. OPP from the northeast are also patrolling those waterways to make sure no one is on them. This is in relation to the Parry Sound 33 fire. Here's a short video of water bomber doing its job. Pockets of high risk between Parry Sound and Sudbury (where Parry Sound 33 continues to blaze), the Kenora area and the far north, in and around Polar Bear Provincial Park. Where is the help coming from? Crews from across the country, the U.S. and Mexico are here fighting the fires and bringing a lot of equipment as well. 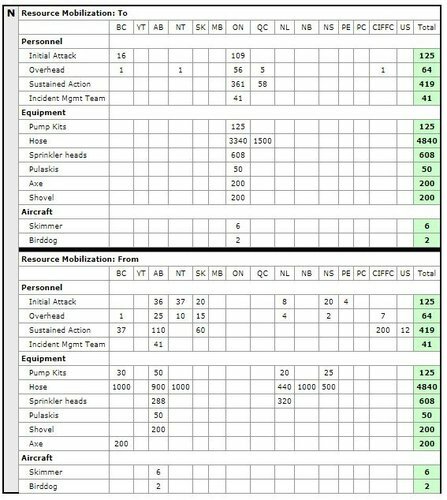 The Canadian Interagency Forest Fire Centre has broken down who is donating what in terms of people, equipment and aircraft. Take a look. Hat tip to Chris Ensing. Big shout out to B.C. for the support, who are currently battling blazes of their own. My name is Haydn Watters and I'm a reporter with CBC News. 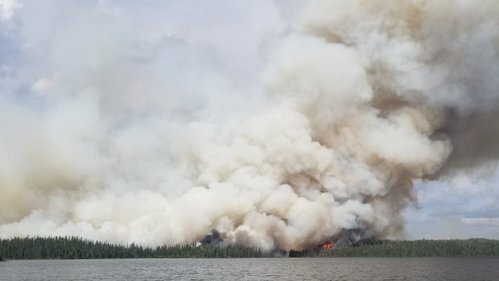 I've been tracking the forest fires in northern Ontario for the last few days, rounding up photos, videos and the most pertinent information you need to know about the fires now. So let's take a look at what you need to know today. Here's the forest fire situation right now. Red denotes active fires, yellow denotes new fires. 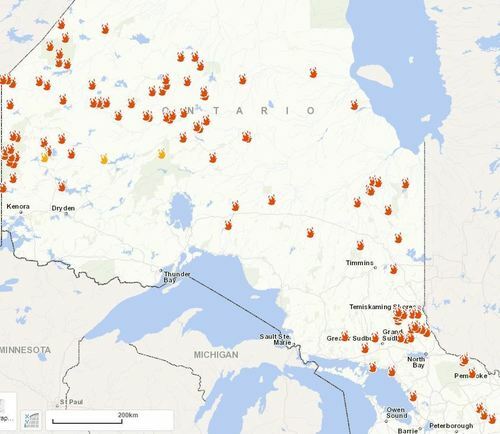 You can check out the ministry of natural resources and forestry's fire map here.